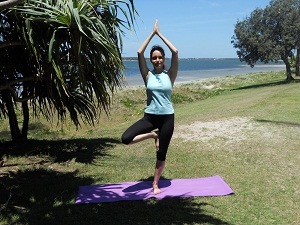 The Tree Pose is one of my favourite balancing yoga poses. It is great for strengthening the muscles in the legs, the knees as well as the ankles and the spine. This exercise is a fantastic hip opening exercise which stretches the groin and inner thigh area. What I love about this pose is that it improves balance as well as increases focus, memory and concentration. The Tree Pose can be a bit challenging to start with, but once you master it, you will love it. You can make this pose as challenging as you like – I will explain the different variations/levels of difficulty below. Starting position: Stand up straight with your arms by your sides and your weight spread evenly across your feet (Figure 1). Variation 1 – Beginners: Place your arms on your hipbones or place one hand onto the wall if you feel a bit unsteady. Shift your weight onto your left leg, bend your right leg and place the sole of your right foot onto your left ankle (Figure 2). Stay in this pose for 4-8 slow and deep breaths. Gently release out of this pose into starting position. Now repeat on the other side. Variation 2 – Intermediate: Place your arms on your hipbones. Shift your weight onto your left leg, bend your right leg and place the sole of your right foot either against your left calf or just above the left knee (Figure 3) – making sure that you don’t put too much pressure on the knee. Stay in this pose for 4-8 slow and deep breaths. Gently release out of this pose into starting position. Now repeat on the other side. Variation 3 – Advanced: Place your arms on your hipbones. Shift your weight onto your left leg, bend your right leg, grab hold of your right ankle with your right hand and place the sole of your right foot against your left upper inner thigh (Figure 4) – pressing your foot firmly against your inner thigh for more stability in this pose. To advance this pose even further, bring your arms up above your head with your hands in prayer position (Figure 5). Stay in this pose for at least 4-8 slow and deep breaths. Gently release out of this pose into starting position. Now repeat on the other side. To make your stabilising muscles work even harder, try doing this pose on uneven ground, such as a folded uneven blanket.